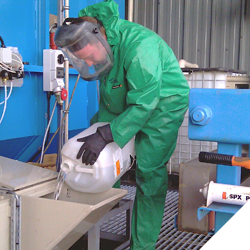 Enerjex 520 is a strong alkaline agent that can be used for neutralising acid waste resulting from; Pickling, passivation. In order to comply with local water authority regulations all acid-waste needs to be treated before discharging to the local public sewer system. Note: A licence to discharge will need to be obtained before legal discharge. Consult your local authority or ask SRL for advice. Gives rapid precipitation of Chromium and Nickel in the form of a sludge which can be sent for disposal. Supplied in 25lt, 200lt or 1000lt Polyethylene containers.